Incorporation of the existing cluster of trees into the house design. A design remissent of traditional house forms. 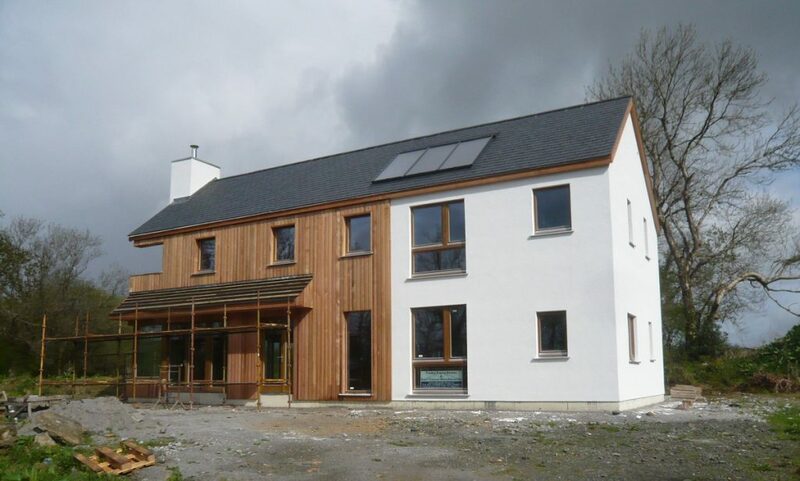 A low energy or passive house design. The solution was the creation of a simple pitched roofed box with tight eaves and deep reveals creating the impression of mass and solidity (akin to traditional farm houses like the family farm house of which the site belongs). This form was then altered in two principal ways. Firstly, the northern side of the house has been pushed and pulled to create niches for service spaces (typically on the northern side in passive solar design) and an entrance. These alterations create useful zones both internally and externally, allow the infiltration of summer evening sunlight, and allow the pitched roof to descend to a lower level relating itself to the tree canopy under which the visitor passes when approaching the main entrance. Secondly, a section of the “massive” southern elevation has been “cut out” and replaced with a more lightweight timber clad section. This strategy accommodates more comfortably the generous amount of south facing glazing required to create useful passive solar heat gain. The site is located in north County Cork about 5 miles west of Mallow in rich farm land know as the Golden Vale. The extensive cultivation has helped characterise the landscape as “Rolling Patchwork Farmland”, that is to say that when viewed from above the landscape looks like a patchwork quilt. Instead of patches of fabric the landscape is made up of patches of grassy fields of various sizes and shades of green depending on the crops and level of grazing (see aerial photo). From the driveway the house can be approached either directly or by a path through the trees to the main entrance. The northern edge of the house includes a number of opportunities to view the trees from inside, and also includes a sheltered external area. The main section of the ground floor plan is quite open, but with the option of closing a sliding screen between the dining and living areas, and also the possibility of creating a discrete utility area to the northern end of the kitchen. On the first floor the master bedroom includes its own south west facing balcony and private garden on its northern side. Above the sun room on the ground floor is an internal sun-space shared by two of the bedrooms. Increase in window to wall ratio on southern elevation. This is of primary importance for passive solar design. To avoid conflict with number 3 above, the facade section with greater window area has been visually separated from the overall mass of the building using timber cladding. In this way, the white mass of the building retains its solid character, while the timber section reads as a discrete contemporary piece. An variably open plan ground floor allows for maximum versatility of the space to cater for the variety of expected uses and for the possibility of unforeseen future needs. The open plan also allows sunlight to fully penetrate the building from its southern side. Arrangement of spaces such that the main living spaces are to the southern side (with large windows giving light and heat) and the primarily service and circulation spaces are to the north (requiring less natural light and smaller windows). This is a typical strategy in passive solar design. Adherence to ecological principals during all stages of design and construction (see list of important principals below). It is hoped that, by retaining many of the fundamental characteristics of the traditional rural housing typology, while including contemporary innovations in a controlled and sympathetic manner, this design might contribute to the evolution of the Irish rural house, rather than to its demise or more concerning the revert to “copy and paste” design strategy. The house is designed to increase solar gain. The living room and dining room are on the south side, service rooms on the north. Glazing on the south façade has been maximised while it is limited to the north. Walls will be constructed using timber frame construction. Timber being a renewable material doesn’t require large amounts of carbon to fabricate, unlike concrete. 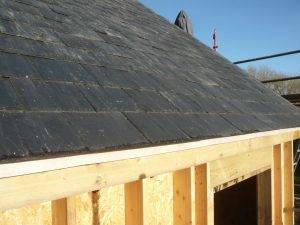 Its growth also helps absorb carbon gasses and when timber is put into a building carbon is essentially taken out of the atmosphere and locked away. 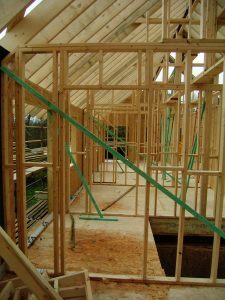 Plus timber frame construction allows higher levels of insulation to be installed, further reducing energy consumption. High performance glazing. Window are always an area of higher heat loss due to their relative low insulation quality, but glazing technology is currently undergoing a revolution and even higher standards of insulation are achievable. A U-Value of 1.1W/m²K is readily available and with U-Values of 0.6 W/m²K (as used on my own house that was featured on Duncan Stewarts “about the house” TV program) entering the market, heat loss through windows can be controlled. For this project a minimum U-Value of 1.1 W/m²K will be used. Timber Window Frames. Timber is a renewable material, unlike aluminium or PVC which deplete mineral resources and create excessive waste. It also has a better insulation value. 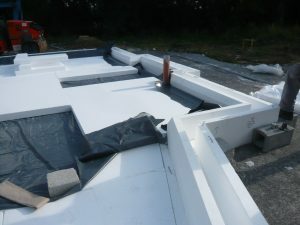 Use of cellulose recycled newspaper insulation. It doesn’t have the high levels of embodied energy (energy required to manufacture and therefore the quantity of carbon created during production) associated with chemical insulations, plus it reuses a waste product. Now it is being manufactured in Ireland, therefore reducing energy consumed for transportation and reducing the amount of waste produced in Ireland. Also, because it is installed through a system of pumping, it means less cold gaps and less drafts. Flat plate solar water heaters. They will meet a large amount of the house’s hot water need substantially reducing fossil fuel consumed. Even in winter the tubes are effective by increasing the temperature of the water, which decreases the energy used to heat the water.